The 6-day trip will give you an unforgettable experience with interesting place sites in the North of Vietnam. It will bring you to natural landscape to discover outstanding feature in Halong Bay and Sapa. Spend 1 night on Halong Bay at luxury cruise and explore ethnic minority life will make you have a wonderful time in Vietnam. 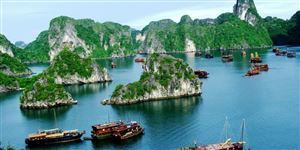 - Enjoy your life onboard the Paradise Luxury cruising in Halong bay – one of the top 7 wonders of the World. 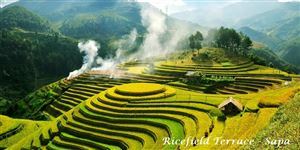 - A scenic drive affording you a view of beautiful valleys and tiered rice fields. Trek through spectacular mountain scenery. - Visit local villages for an insight into the life and culture of the ethnic minorities . - Warmly welcome at Ha Noi airport after you take a flight no. MH 752 (09:40 – 12:00). Transfer to the city center for lunch. - After enjoying lunch with Cha Ca La Vong (famous traditional fish rolls in Hanoi), start Hanoi city tour with the official symbol of Hanoi, Van Mieu – Quoc Tu Giam (Temple of Literature), the first Imperial University of Vietnam which was built in 1070. - Then visit the Ho Chi Minh Mausoleum to explore the architectural and historical aspects of Uncle Ho’s final resting-place. Just next door is Ho Chi Minh’s house on stilts and lying to one side of the Mausoleum is the One Pillar Pagoda, which was founded by King Ly Thai To in 1049 - the structure has become an important symbol for the people of Hanoi. - Have the cyclo trip around the Old Quarter, through Hoan Kiem Lake, Hanoi Opera House and St. Joseph’s Cathedral. - Have dinner & take an overnight train to Lao Cai (departure times around 20:30 p.m – 23:30). Overnight on the train. - You will explore the Ham Rong Mountain with unspoiled scenery and spectacular. Here, you can visit many kinds of colorful orchid garden from Indochina area. Passing two Heaven Gate, you will be arriving in the top of Ham Rong is called Pitch Cloud, and have panoramic view of Sapa. Have lunch at a local restaurant. - After lunch, visit Cat Cat - Shin Chai villages of Black Hmong people. There, you’ll have a chance to Cat Cat waterfall, learn culture, unique customs of the people here with traditional crafts such as weaving, touching carved silver, forged agricultural tools. Enjoy Sapa Love Market, a traditional market of ethnic minority at night (on Saturday night). - After breakfast, Start walking tour for Muong Hoa valley where we can admire magnificient landscapes and trek on a small trails going to Y Linh Ho village (with Black H’mong tribe). Trek through lush rice – terraces towards Lao Chai village, experiencing Black H’mong people’s daily life and traditional culture. - Next cross suspension bridges as you walk through Lao Chai village to Ta Van village inhabited by Dzay minorities exhibiting strong Chinese culture. Go back to Lao Cai for an overnight train to Hanoi. The train departs at 9:15 pm. - You arrive Hanoi at 5 am, take breakfast in Hanoi then transfer to Ha Long bay. Arrive in Halong Bay at the jetty around at noon. Our crew welcome you on board the Deluxe Cruise. Enjoy a welcome drink, check-in your cabin. A fresh seafood lunch will be served. At that time, we will begin our 3.5 hours cruise through mystic Ha Long Bay to see the amazing karsts with different formations: Mat Qui (Monster's face) islet, But Moc islet, Cap De islet, Trong (Drum) cave, Trinh Nu cave, floating fishing village, with its unique way of life. - Then head to Luon cave, enjoy swimming, sun bathing. Enjoy another seafood feast for dinner and for the night owls, there is an option of night fishing. - Early birds can attend a Tai Chi demonstration on the s undeck at the break of dawn. Start the day enjoying some Paloma delights with a colourful buffet breakfast. - Visit the Vung Vieng floating fishing village by bamboo sampan for an hour in to the village. Short visit to the Pearl Farm to learn how natural pearls are grown. Then, return to Paloma Cruise for your leisure or join one of the following optional activities: Sunbathing, traditional massage, swimming etc. - Enjoy Set Menu for lunch in the dining room. Relaxing on the sundeck or in the dining room, enjoying the rest of Halong bay before getting back to harbor. Back to Hanoi. Arrive in Hanoi at around 4:30 pm. - Free shopping at local specialty supermarket. - Then enjoy the traditional Water Puppet Show. Dinner at a local restaurant. - Overnight in Ha Noi. - After breakfast, check out hotel. Enjoy Vietnam typical coffee then transferring to the airport for your flight home. Departure on flight no. MH753 (13:00 – 17:40). - The package price are not applied for period of Vietnam National Holidays including: Lunar New Year, Reunification & Labour day (28th April to 03rd May), Hung King Death Anniversary (16th April), Independence Day (02nd Sept), New Year 2017 (31st Dec to 2nd Jan). - Group from ever 15 pax up + 1 FOC for Tour leader (without air ticket) on twin/triple sharing. Special rate will be applied for tour leader going with the groups of under 15 pax. - Pick-ups and transfers by air-conditioned vehicle as specified in the itinerary above. - Visa fees, travel insurance, Personal expenses, etc.